I had my Gilt Sylke Twist Strawberry piece out during embroidery class the other day for a “show and tell” sort of session. I like to drag out different needlework projects or samplers to show the kids, hoping maybe to fuel a real desire to pursue needlework beyond dishtowels. Well, this piece has just been sitting around, waiting for me to do something with it (or not…). There I sat, after class, prior to clean-up, absorbing the silence for a moment and staring at the scraps of embroidery threads, the snippets of fabric and felt, the thread boxes that had been foraged through by some kid, the stack of ironed towels equally burrowed through…. and getting ready for the inevitable clean-up that comes from two large classes in a row on the same day. But still, I just sat there. Absently, my brain wandered to the next item in sight. It was a box – one of those boxes just like the quick silk ribbon embroidery box project I did a few weekends ago – except it was gold and cream instead of purple and white, and it was unfinished. Ahhh….. Toooooools….. I love toooools. Uhhh…? Hm. Ugh. Oh, maybe. Do I, or don’t I? 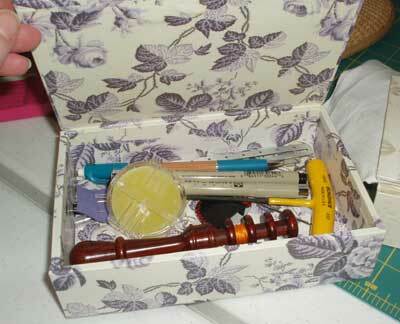 Not just tools and accessories, but tools and accessories in a pretty box…. But then there’s this other side of me, answering the grumbling side, insisting that at least it would be finished…. And then there’s this other side of me whining about …. dirt. 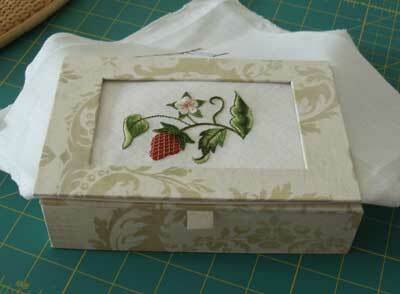 July 25, 2008 Gilt Sylke Twist Strawberry Box – Yep, I did it! Well, it sure doesn’t look shoddy to me! I think it’s beautiful! I have gilt sylke twist strawberry on a gold and cream box envy! I’ve been visiting your site almost every day, but I haven’t been posting comments for the simple reason that there are only so many incredulous, excited, admiring exclamations in the English language. That being said, I LOVE your GST strawberry! It looks really good with the gold and cream box. . .is there some way you could cover the embroidery to protect it? I think the box is the perfect size and colour for it. dirt, shmirt! enjoy your work and use it where you’ll see it often. 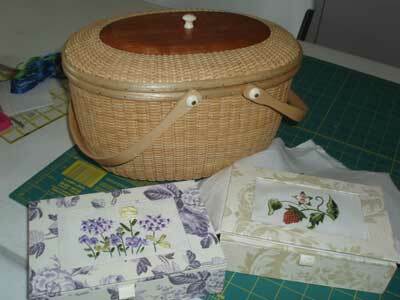 I put a lot of work into my embroidery basket and I LOVE seeing it while I’m embroidering. And I get a lot of comments when I bring it somewhere too. You could always put some kind of clear plastic protective cover over the work… but myself, I wouldn’t. I love the tactile qualities of hand embroidery (and my crazy quilting). Mary, don't use GST on a utility box. Instead incorporate it into a Jacobean piece by adding a scallop border – either stop there- or continue onward with connecting tendrils into other GST fruit (golden pear) also encircled in scallops. Wall hanging, I say. I vote that you get it framed & matted, loan it out to museums, or keep it on exhibit at your home school. 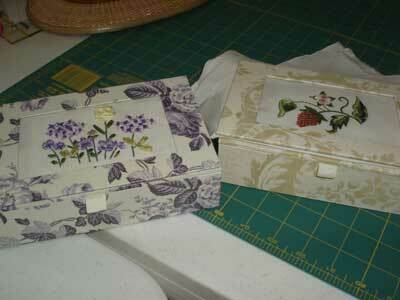 That cream box could use other silk ribbon flowers in pale gold, creams & mint green. You'll start a collection of ribbon flower boxes! I say quite your whining and get it done! Your strawberry looks almost as good as those I have been picking in my garden this year! But your strawberry will last longer, even on the box. Do it and enjoy it! Hi, all! Thanks for your comments! It’s funny, every single comment has something of what has gone through my head on this piece. It’s not SO much the GST that makes me hesitate (strangely enough), but rather the quality of linen! Right now, I have GST coming out of my ears, (not literally – don’t bother visualizing! ), but I’m short on good linen. I’ve got a lot of stitching-related work to do this weekend, so we’ll see what happens when I’m in the workroom again! I’ll let you know what I finally do with it. The box does have its appeal. Absolutely beautiful. The white box with the strawberry is awesome. Your works give me encouragement to try a few things. I enjoy your site very much. look forward to you daily. Thanks for the sharing. It looks great in the box, Mary! Just go for it. It’s certainly better than having GST strawberry sitting in a drawer where you can’t enjoy it!